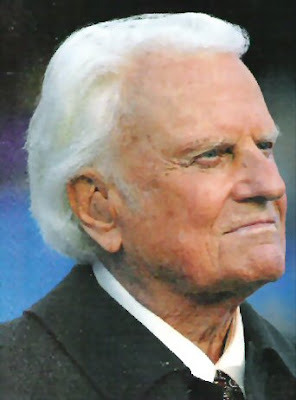 Billy Graham is now 90 years old with Parkinson's disease..
come and let us honor you.' So he agreed..
couldn't find his ticket, so he reached in his trouser pockets. It wasn't there, so he looked in his briefcase but couldn't find it. The conductor said, 'Dr. Einstein, I know who you are. We all know who you are. I'm sure you bought a ticket. Dr. Einstein, don't worry, I know who you are No problem. Einstein looked at him and said, 'Young man, I too, know who I am. Having said that Billy Graham continued, 'See the suit I'm wearing? luncheon and one more occasion. you to immediately remember the suit I'm wearing.